From the Mexican-American Legal Defense and Education Fund (MALDEF), a six-minute film commemorating Latino contributions to America, with a Latin version of the “Star-spangled Banner” performed by the Rondstadt Generation. Can anyone identify the Medal of Honor winner pictured? When MALDEF announced its lawsuit against Arizona’s anti-immigrant SB1070 at the state capitol in Phoenix, President and General Counsel Thomas A. Saenz took with him an iconic delegation of Latino leaders, renowned as symbols of American perseverance, including Dolores Huerta, Arizona native Richard E. Chavez (brother of Cesar E. Chavez), and legendary recording artist, Linda Ronstadt. These leaders’ contributions to American progress stood in stark contrast to the anti-Latino environment in Arizona; and it was out of that contradiction that MALDEF was inspired to develop “America, Our Home,” a project to set the record straight and celebrate the Latino legacy in the United States. MALDEF staff works relentlessly each day to spread this message, but MALDEF needs your support to ensure that that message reaches every American in every state and municipality across the country. MALDEF’s compelling short film featuring The Star Spangled Banner from a new collection of American patriotic songs recorded in Mexican musical styles by the group Ronstadt Generations, also titled “America, Our Home.” The film is directed by Edgar Pablos and features the photography of George Rodríguez, well-known for photographing key moments in the Chicano Civil Rights Movement. Laughing shake of the old scrub brush to MoveOn.org. Unknown, Pectoral with Calendrical Notations (AD 700–1300), gold, 4 ½ x 1/16 in (11.5 x 2 cm), 3.93 ounces (112 grams), Museuo de las Culturas de Oaxaca. Photo © Instituto Nacional de Antropologia e Historia (CONACULTA-INAH-MEX), from the exhibition Children of the Plumed Serpent: The Legacy of Quetzalcoatl in Ancient Mexico at the Los Angeles County Museum of Art, Los Angeles, California. The culture-hero and deity, Quetzalcoatl was believed to be the human incarnation of the spiritual forces of wind and rain. Quetzalcoatl was typically portrayed in art as a plumed serpent. This exhibition was organized by the Los Angeles County Museum of Art and made possible by the National Endowment for the Humanities. Numerous projects are being undertaken to increase the opportunities for historic places associated with American Latino history to be documented, preserved, and interpreted and for the public to better understand and appreciate the role of American Latinos in the development of the United States. Photos from the U.S. National Archives that relate to Hispanic Heritage on the photosharing site Flickr. 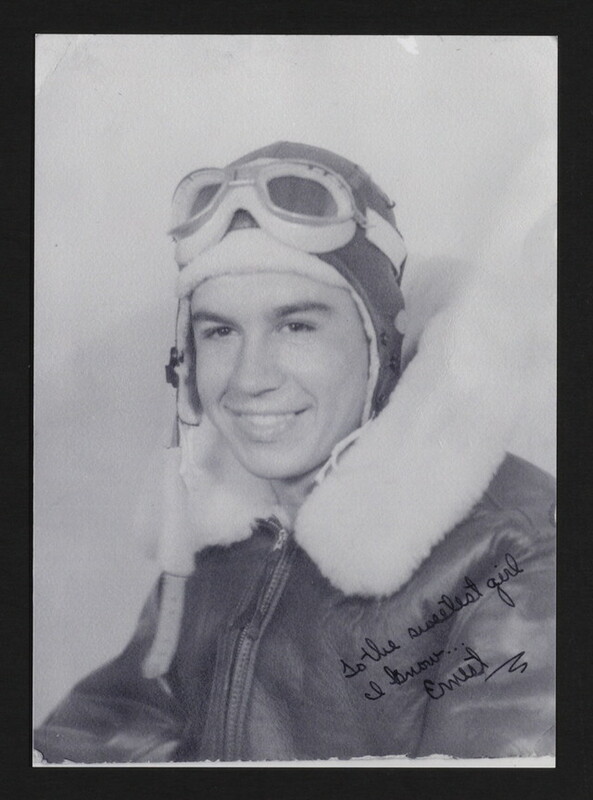 Asked to serve their country in time of war, Hispanic Americans displayed courage and valor in the face of adversity. Familiar with discrimination back home, many saw their service as affirming the ideals of democracy. In this presentation, the Veterans History Project recounts their inspirational stories. It’s amazing what is not available on video for use in the classroom. Texas kids have to study the “Grito de Dolores” in the 7th grade – the “Cry from Dolores” in one translation, or the “Cry of Pain” in another (puns in Spanish! Do kids get it?). 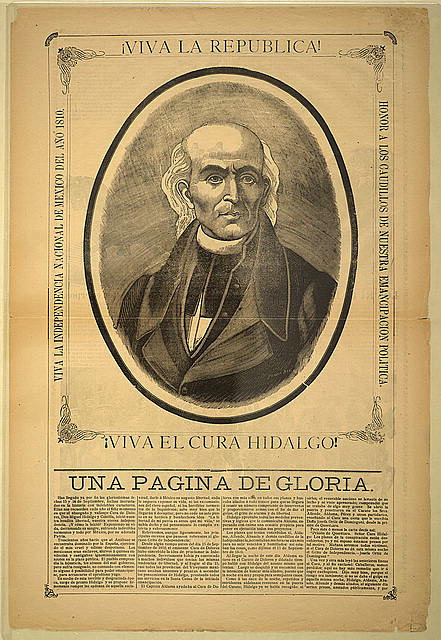 Father Miguel Hidalgo y Castillo made the speech on September 16, 1810, upon the news that Spanish authorities had learned of his conspiracy to revolt for independence. The revolution had been planned for December 8, but Hidalgo decided it had to start early. This date is celebrated in Mexico as Independence Day. Traditionally the President of Mexico issues an update on the Grito, after the original bell that Father Hidalgo used is rung, near midnight. 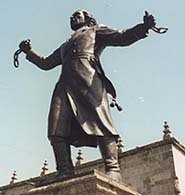 Hidalgo himself was captured by the Spanish in 1811, and executed. Statue of Father Hidalgo in Dolores, Mexico. It’s a great story. It’s a good speech, what little we have of it (Hidalgo used no text, and we work from remembered versions). It’s important to Texas history, too — it’s difficult to imagine Tejians getting independence from Spain in quite the same way they won it from Mexico. Why isn’t there a good 10- to 15-minute video on the thing for classroom use? Get a good actor to do the speech, it could be a hit. Where is the video when we need it? Update from 2008: Glimmerings of hope on the video front: Amateur videos on YouTube provide some of the sense of what goes on in modern celebrations. The Grito de Dolores (“Cry of/from Dolores”) was the battle cry of the Mexican War of Independence, uttered on September 16, 1810, by Miguel Hidalgo y Costilla, a Roman Catholic priest from the small town of Dolores, near Guanajuato, Mexico. Although many mistakenly attribute the Cinco de Mayo holiday as the celebration of Mexican independence, Sept. 16 was the day the enthusiastic Indian and mestizo congregation of Hidalgo’s small Dolores parish church took up arms and began their fight for freedom against Spain. Portals to the World contains selective links providing authoritative, in-depth information about the nations and other areas of the world. Resources on Mexico include information on the country’s history, religion, culture and society to name a few. September is also a notable month for Hispanic culture with the celebration of Hispanic Heritage Month Sept 15 – Oct. 15. Sept. 15 is significant because it is the anniversary of independence for Latin American countries Costa Rica, El Salvador, Guatemala, Honduras and Nicaragua. In addition to Mexico’s independence day on Sept. 16, Chile recognizes its independence day Sept.18. Also, Columbus Day or Día de la Raza, which is Oct. 12, falls within this 30-day period. My Children, a new dispensation comes to us today…Will you free yourselves? Will you recover the lands stolen three hundred years ago from your forefathers by the hated Spaniards? We must act at once.Cry of Dolores, attributed to Father Miguel Hidalgo y Costilla, September 16, 1810. Early on the morning of September 16, 1810, Father Miguel Hidalgo y Costilla summoned the largely Indian and mestizo congregation of his small Dolores parish church and urged them to take up arms and fight for Mexico’s independence from Spain. His El Grito de Dolores, or Cry of Dolores, which was spoken—not written—is commemorated on September 16 as Mexican Independence Day. Father Hidalgo was born into a moderately wealthy family in the city of Guanajuato, northwest of Mexico City, in 1753. He attended the Jesuit College of San Francisco Javier, received a bachelor’s degree from the University of Mexico in 1774, and was ordained into the priesthood in 1778. 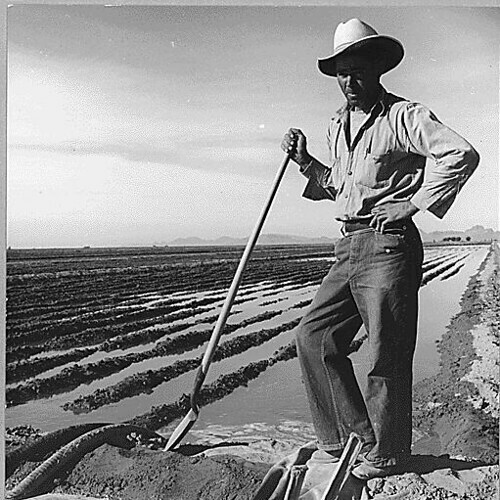 He soon earned the enmity of the authorities, however, by openly challenging both church doctrine and aspects of Spanish rule by developing Mexican agriculture and industry. In 1803, Hidalgo accepted the curacy of the small parish of Dolores, not far from his native city of Guanajuato. Between 1803 and 1810, he directed most of his energy to improving the economic prospects of his parishioners. He also joined the Academia Literaria, a committee seeking Mexico’s independence from Spain. In September 1810, Spanish authorities learned of the group’s plot to incite a rebellion. On September 13, they searched the home of Emeterio González in the city of Queretaro where they found a large supply of weapons and ammunition. Warned of his impending arrest, Hidalgo preempted authorities by issuing the El Grito de Dolores on the morning of September 16. Attracting enthusiastic support from the Indian and mestizo population, he and his band of supporters moved toward the town of San Miguel. The rebel army encountered its first serious resistance at Guanajuato. After a fierce battle that took the lives of more than 500 Spaniards and 2,200 Indians, the rebels won the city. By October, the rebel army, now 80,000 strong, was close to taking Mexico City. Hidalgo, fearful of unleashing the army on the capital city, hesitated, then retreated to the north. He was captured in Texas, then still a part of the Spanish empire, and executed by firing squad on July 31, 1811. After ten more years of fighting, a weakened and divided Mexico finally won independence from Spain with the signing of the Treaty of Córdoba on August 24, 1821. View the Huexotzinco Codex, one of the Top Treasures in the Library of Congress’ American Treasures online exhibition. The codex is an eight-sheet document on amatl,a pre-European paper made from tree bark in Mesoamerica. It is part of the testimony in a legal case against representatives of Spain’s colonial government in Mexico and dates to 1531, ten years after Mexico’s defeat. Touring Turn-of-the-Century America: Photographs from the Detroit Publishing Company, 1880-1920 has a rich collection of photographs of Mexico, many of them by noted photographer William Henry Jackson. To view these pictures, search the collection on Mexico. Search the collection Taking the Long View: Panoramic Photographs, 1851-1991 on Mexico to find panoramic photographs. Read the Today in History feature on the Mexican holiday Cinco de Mayo, which celebrates Mexico’s defeat of French troops at the town of Puebla in 1862. This event is also widely celebrated by Latinos in the U.S.
With over 8,000 items, The South Texas Border, 1900-1920: Photographs from the Robert Runyon Collection is a unique visual resource documenting the Lower Rio Grande Valley during the early 1900s. Search the collection on terms such as weddings to gain insight into turn-of-the-century border culture. 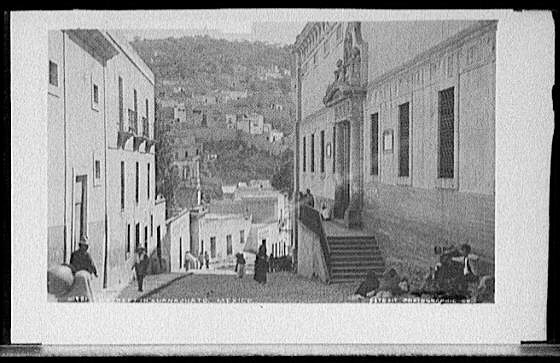 To locate resources for the study of Mexico and its history, search the Handbook of Latin American Studies, an online bibliography of works selected and annotated by scholars of Latin American history and culture, or visit the Hispanic Reading Room, which also offers a portal for online information on Mexico. Share this bit of history: Tweet about it, note it on your Facebook page, or spread the word some other way. You are currently browsing the Millard Fillmore's Bathtub blog archives for the day Sunday, September 16th, 2012.